Have you found yourself wishing you had a straighter smile, but thought orthodontic treatment was only for teenagers? The truth is, every year, millions of adults undergo teeth straightening treatment to improve their smiles and their lives. At David Spilkia Family & Cosmetic Dentistry in Philadelphia, PA, we want patients of all ages to understand the power of a beautiful, straight smile, that’s why we offer Invisalign treatment. Invisalign is an alternative to traditional braces that is very effective at straightening teeth, making it an ideal solution for teenagers and adults. If you are in Philadelphia, or the surrounding area, and are interested in achieving a straighter smile, you should call our office today. No brackets. No wires. Yes, we’re serious. Invisalign is a revolutionary way to straighten teeth that doesn’t involve metal brackets or wires. Instead, we use digital technology in combination with impressions of your teeth to map out a precise straightening plan that is unique to you. We then use this plan to create a series of aligners trays that will gradually reposition your teeth into a straighter smile. With the Invisalign system, we can give you a digital preview of how your newly straightened smile will look following treatment. We can also give you an accurate estimate of the exact time it will take for you to achieve your new smile. Adults and Teenagers – It is always necessary to consult with your dentist, as there are certain situations in which Invisalign is not an optimal solution. Compliance with aligner tray wear is vital to the success of treatment. Mild to moderate alignment. Invisalign can correct a wide variety of problems, including overbite, crossbite, underbite, crowding, and gaps. Certain cases of severe misalignment may not respond to Invisalign treatment. We will always let patients know if their case is suitable for Invisalign. Discreet – Invisalign uses a system of clear plastic aligner trays that are virtually invisible when you smile. This makes the treatment ideal for patients who routinely speak in front of others and do not wish to wear traditional braces. Affordable – We can estimate the treatment timeline for Invisalign with good accuracy, which allows you to budget for you treatment. Also, treatment is often completed faster than traditional braces. 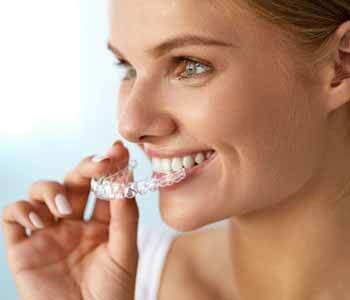 Most patients complete Invisalign treatment within about a year and a half. Improved oral health – Removable aligner trays make it easy for patients to practice good oral hygiene, which means you won’t have to try to brush and floss around brackets and wires. Improved self-confidence – The clear aligners of Invisalign allow patients to really see the progress of treatment which can improve self-confidence while undergoing treatment. Texting available direct through our mobile site – no more waiting on hold! At David Spilkia Family & Cosmetic Dentistry, our goal is to improve the health of our patients while also helping them to enjoy a beautiful smile. We work closely with every patient to come up with customized treatment plans to get the desired results. Together, we can help improve your smile and quality of life, whether you are looking for Invisalign treatment to straighten your smile, or you are simply in need of a new, compassionate dentist you can trust with your oral health. Having a straighter smile opens a whole new world of opportunities. Individuals with straight teeth and beautiful smiles are generally seen as friendly, successful, outgoing, and happy. If you are ready to improve your confidence with a brand-new smile, please call our office at (267) 463-2777 to schedule your Invisalign consultation. Once we determine that you are a candidate for Invisalign, we can map out your treatment plan and get you started on the journey to your new smile as soon as possible.